Greetings from Mamallapuram, India. Here is this months best reads from around the web. This week saw the release of a new breed of carry-on travel bag which I believe is a game-changer in bag design. The ProTravel Carry-on was launched via Kickstarter and it has already seen demand that has got the project funded within 24 hours. The bag is designed and created by Jimmy and Doug from Minaal. I know the guys personally and I’ve been watching the bag develop over 2013. I’ve ordered my own bag which is on sale at Kickstarter at a discounted rate. The new iPhones are out and I know many digital nomads come to Bangkok to buy unlocked iPhones. Richard Barrow has the unofficial prices of iPhone 5s and iPhone 5c at MBK in Bangkok. Vietnam: A History by Stanley Karnow. I’ve been based in Ho Chi Minh City for most of this year so I have finally gotten round to reading more about its history. Vietnam: A History is considered to be the most comprehensive book on the Vietnam/American war so this is a good starter read. To give a better understanding of how the war began, Karnow covers the history from first European contact. And more news on iPhones (of which half of my newsfeed seems to have been iPhone related this week), here are the most expensive countries to buy an iPhone. While the Big Mac Index covers more countries I like this idea of comparing phones prices to gauge costs around the world. Greater Mekong Subregion single-visa plan gets nudge forward. There is talk of a single visa (not unlike the Schengen Area of Europe) that would cover Thailand, China (Yunnan Province and the Guangxi Zhuang autonomous region), Burma, Cambodia, Laos and Vietnam. That would certainly save on the one-page visa stamps in my passport. Speaking of passports, the British passport is No.1 for visa-free travel. I often get told that I’m lucky for being able to work and travel. Lucky is said as if this business just dropped on my lap, when in fact I’ve worked for years to get where I am. I will say though that I know I’m lucky to hold an Australian passport and to be born in a country where I have the chance to travel freely. Australia is ranked sixth in the list of best passports to hold. Check out the full list of countries at the annual 2013 Henley & Partners Visa Restrictions Index [PDF]. Wandering Earl has now been on the road for 5000 days. Mike Spencer Bown becomes world’s most travelled after finishing 23-year odyssey. While I’m not sure of accuracy of being the world’s most travelled (as there are travellers who don’t document their journey), it is still an impressive life of travel. Giving money to child beggars is the least generous thing a tourist can do. Anthony Bourdain on how to travel. Facing Death: why one man travels to embrace life – After having a brain tumor removed this man downsizes and hits the road. http://downtowntraveler.com/2013/09/15/photos-art-and-obsession-merge-at-the-watts-towers-in-south-central-la/ – I have been to LA a few times and I still haven’t been here, so I am putting it out there that I MUST visit next time I am in LA. Kowloon Walled City: Life in the City of Darkness – An old post that I saw this week; this is a place I wish I could have seen. I have visited Penang numerous times since living in Southeast Asia under the guise of doing a visa run, but that was just an excuse to go on an eating holiday. Food is a serious business in Penang, and this article on the noodle master of Penang at Roads and kingdoms is a wonderful article on Penang food culture. Here Be Duck Trees and Sea Swine: A fun interactive Renaissance map of monsters of the deep. There were rumours this week about the death of John McAfee (he’s is still alive). If you don’t know the McAfee backstory, start here: Secrets, Schemes, and Lots of Guns: Inside John McAfee’s Heart of Darkness. One of my favourite travel movies is ten years old. Sofia Coppola discusses ‘Lost in Translation’ on its 10th Anniversary. I love this movie but seems to be one of those movies that you get or you don’t. the Amazon reviews have nearly as many 1 star reviews as 5 stars. How 5 Countries Could Become 14 – a hyperthetical map of how the Middle East could be redrawn. This month I travelled to Hanoi with Dan from TropicalMBA, where in between cafe hopping and eating great Vietnamese food, he was writing his first book. Hanoi made it on his list as one of the best places in Southeast Asia to write a book. The comments are providing plenty of other suggestions as well. Interview With A Digital Nomad – Stacey Herbert left her life in London to live and work in Thailand and Indonesia. How I knew I wanted to become a digital nomad – If you want to live this lifestyle you will need to ditch the backpacker mindset and work with a business mindset. Nomadic Samuel confirms that Chiang Mai is the perfect base for digital nomads. Google announces a new Tech Hub Network, kicking off with 7 co-working spaces in North America. For migrants, new land of opportunity is Mexico. Christine from Almost Fearless is compiling a timeline of a brief history of digital nomading. I started working on the road in 2003, but the term digital nomad wasn’t used then so it is great to see someone trying to work out pivital moments. Christine makes a good point that most people who are working remotely aren’t blogging about it (like coders getting work from elance, for example) so there is no way of knowing how big this movement is. A Digital Nomad in Rishikesh – Stephen Bugno finds a city in India that makes for an ideal working base. 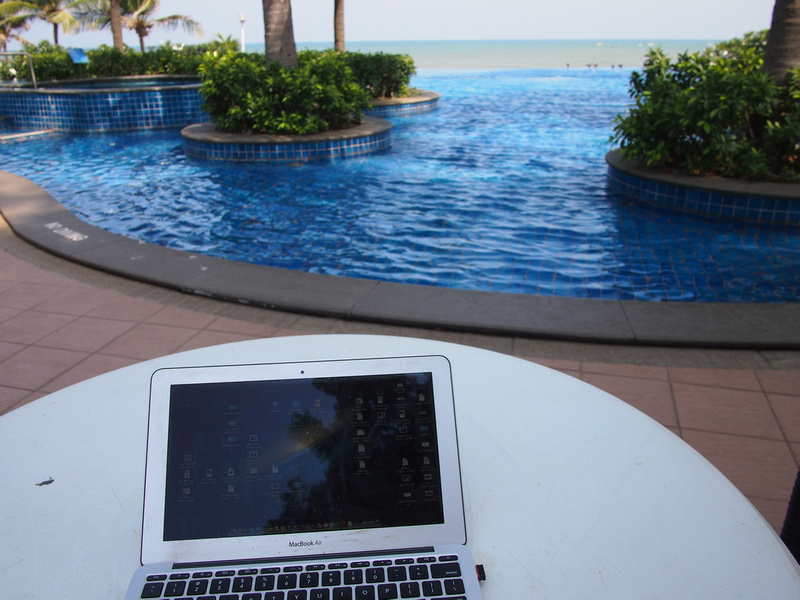 The BBC highlighted three prominent digital nomads, when work is a nonstop vacation. It’s not really a nonstop vacation, but the headline made you click, no? My friends and I bought an island – 10 guys buy an island for under 100K. A friend of mine and fellow long-term traveller, Runaway Juno, is running a conference for Asian women who would like to travel and/or become location independent. Juno set up the AWE Conference after overcoming the cultural obstacles that Asian women face in wanting to travel solo and taking an unconventional path to working. THe conference will be held in KL in November, 2013. Why I spent my money to rent a helicopter on 9/11 – That old adage of “you have to spend money to make money” rings true. Photos of Burning Man 2013 – A photo essay of the annual arts and music festival in the Black Rock Desert of Nevada. 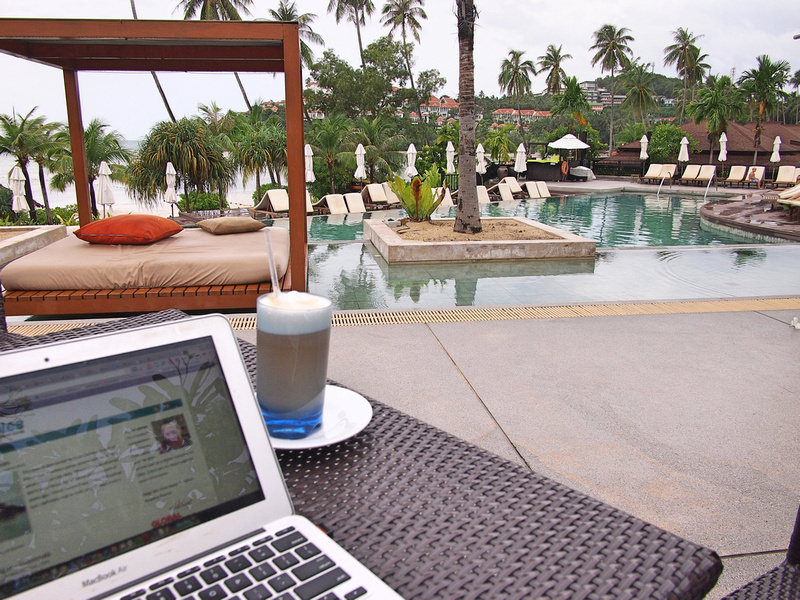 Wworking from the Radisson Blu Plaza Resort in Phuket, Thailand. It’s the tail-end of rainy season here so there are less people around, and it is nicer to work outside. Of course being from countries that allow free and easy access to places makes life all the more easier. Being British myself travel is often easy and hassle free, but being from the more restricted countries should not deter people at all as everyone is capable of travelling if they really want to! some great links! PS: your office is looking pretty appealing!